Every year, between five and 13 million more tons of plastics wind up in the world’s oceans and a whopping 80 percent of that waste pours in from just 20 countries. China is the most egregious offender, discarding nearly 30 percent of the world’s ocean-bound plastics, according to a new country-by-country analysis of plastic trash in the sea published Thursday by Science. No matter where it comes from, these plastics kill thousands of seabirds, sea turtles and marine mammals each year. Discarded bottles and packaging containers can also leak chemicals such as bisphenol A, which could be consumed by fish and eventually cause health problems for consumers. The economic cost of such pollution runs high, too -- communities in California spend at least $428 million a year combating litter and clearing trash from their beaches, according to the Natural Resources Defense Council. These problems are likely to only get worse unless something changes, the authors of the newly published analysis say. In the new study, a group of engineers and environmental scientists define how much plastic trash makes its way into the oceans each year and where all of that trash is coming from. Though researchers have long known that the oceans were filling with plastics, they did not have a good estimate for how much more plastic poured in each year until now. That's something that has prevented them from knowing just how bad the situation might get if the world continues to use and discard plastics at the current rate while the global population rises. By using a computer model, the team estimated that in 2010, about eight million tons of trash – or five grocery bags filled with plastic for every foot of coastline – were dumped into the world’s waters. The team also broke down the plastic waste generated by people from 192 countries who were living within 30 miles of a coast. 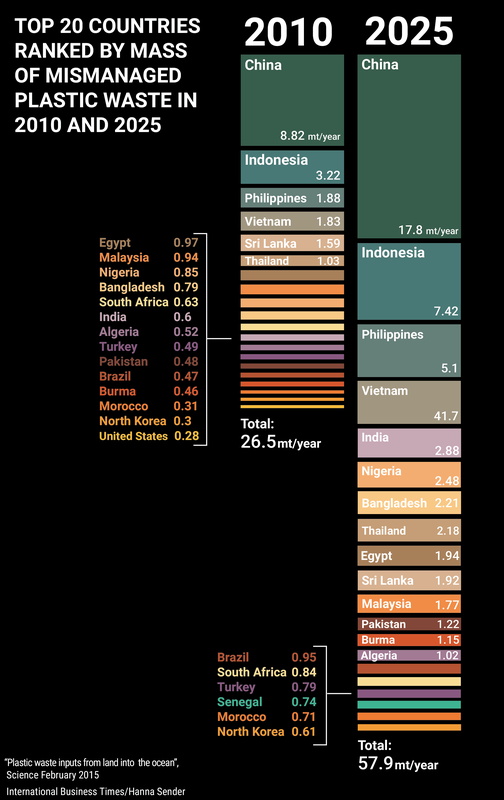 Indonesia, the Philippines, Vietnam and Sri Lanka rank among the top five polluters along with China. The United States ranks twentieth from the top. Looking ahead, the researchers found that if nothing changes, as many as 155 million tons – or 10 bags of trash for every mile of coastline – could be tossed out and find its way into the oceans in 2025. Most of that increase will come from countries such as China and Vietnam, which currently rank in the top five and are expected to discard twice as many bottles and bags as their economy grows. India is also expected to jump up in the ranks from its current 12th place. 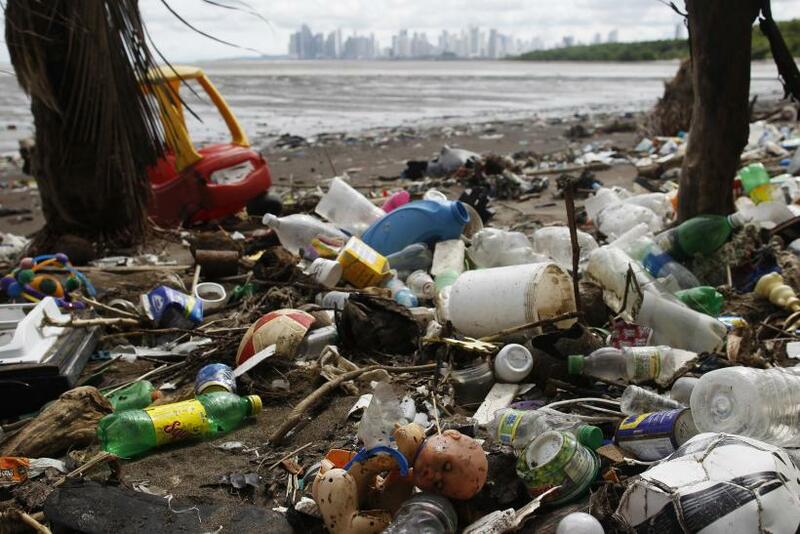 Overall, most of the plastics that ended up in the ocean came from the spillover of waste management systems – in other words, some of it was intended to be thrown away but was somehow lost in the process, perhaps by blowing out of open dumps. In many developing countries, modern waste management systems are a lower priority than clean water and sewage treatment, lead author of the analysis and University of Georgia environmental engineer Jenna Jambeck said in a statement. As these countries develop, they also tend to use more plastic. Global consumption of plastic resin, used in throwaway items like bottles and plastic bags, has increased by 620 percent since 1975, according to the authors. Their findings were funded by the Ocean Conservancy, an environmental advocacy group, and presented at the annual gathering of the American Association for the Advancement of Science in San Jose, California, on Thursday.